Chthonic (閃靈) is a Taiwanese metal band, formed in 1995 in Taipei. The group incorporates influences from traditional Taiwanese music including the classical Chinese instrument erhu (the band often calls it hiân-á in their native Taiwanese). The band’s stated goal is to use their music to bring ancient history and mythology into the modern era via a pan-green focus, especially to build awareness of the myths of Taiwan and tragic events in that country’s history. Since 2011 their trademark erhu has been complemented with stringed instruments including the koto and shamisen, as well as Tibetan bells and shakuhachi and pgaki flutes, the latter of which are traditionally used by the aboriginal people of Taiwan. The band members are also acclaimed artists and political activists who advocate independence for Taiwan and self-determination for Tibetans and Uighurs. Singer Freddy Lim is currently the Chairman of the Taiwan chapter of Amnesty International. Another week, another Golden Melody nominee. 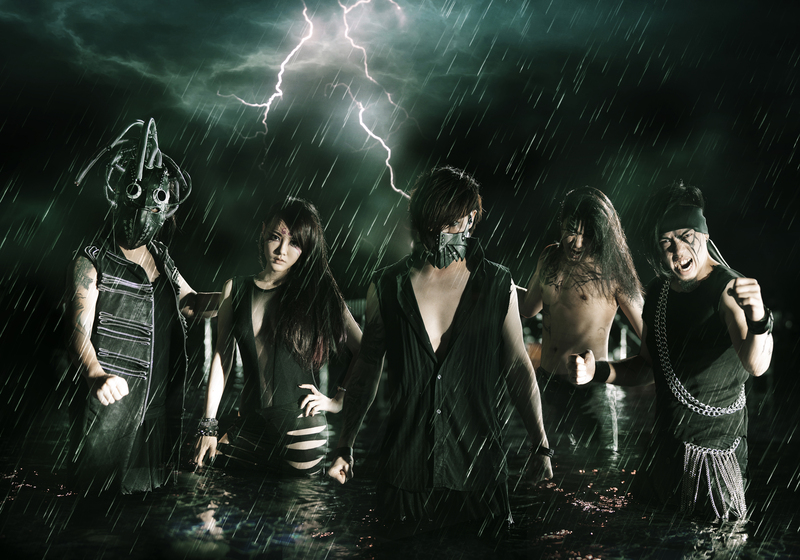 This week we have Chthonic, who have been nominated for Best Band at this year’s Golden Melody Awards. They have actually been requested for a feature a long time ago and I never got around to it. Sorry about that! I am not a fan of metal music at all. It is probably why I kept putting this off for so long. It seems to be the kind of genre where if you don’t like it, you hate it. I listened to three albums and tried my best to pick out songs that I thought were better than the others. I’m not sure what exactly metal fans look for in regards to metal songs, but I chose the ones that have a lot of energy and nice melodies. Chthonic incorporates traditional Chinese instruments into their music, which adds something extra to make their music more interesting to me. The people that doesn’t like metal will most likely still not like metal after listening to them, however, their last album is different. Last year they released an album named “Timeless Sentence” with acoustic versions of their older songs. The traditional instruments are now the focus; the electric guitars were dropped in exchange for acoustic guitars, and Freddy is now singing normally instead of screaming. The instrumentation and how everything comes together sounds great. The acoustic version of “Defenders of Bu-tik Palace” might be one of the best Cpop songs of the year. Check out the album if you’re interested in this. I tried to limit the amount of songs I use from that album because it’s not their usual sound. They were nominated for Best Band last year as well but didn’t win. I think they have a good chance of winning this year. I have checked out the other bands that are nominated and I don’t think what I heard matches what Chthonic put out for this year’s nomination.